Loopia Review 2019: Is Loopia a Good Hosting? Loopia was founded in 1998 and over the years it has provided web hosting customers with affordable Linux and Windows hosting packages with great features. Loopia have been in the hosting business for a little over 20 years. With over 200,000 customers, they’re of the largest hosting services in Scandinavia. Their data centers are located in Arizona, California, and Nevada. Loopia provides you with everything you need to create and manage your website, blog, or emails. The shared hosting for personal and businesses comes with a one-click installer that lets you set up a website using your favorite CMS or app. You can create a simple site directly on your browser using the Loopia Website Builder with an intuitive drag and drop interface. Unlike some hosting services, Loopia’s sign up is short and simple. Your web space will be set up within minutes. You can then register your domain, transfer your website, or set up a database-driven one using WordPress or Drupal or Joomla. For those who like to code, their is a library of scripting languages, such as Perl, Python, PHP, and ASP.NET. When you sign up with Loopia, you’ll also receive Free Google AdWords vouchers to kick-start your online advertisements. Not many hosting services offer such a service. You can choose which keywords you want to advertise and promote them in the Google Search Engine. At a time when websites are facing relentless attacks, you want to have a partner who watches over your web resources day and night. Loopia provides DDOS protection against hackers, identity theft, viruses, and spyware. All their hosting packages come with a 3-months free and continuous protection. Switching or upgrading Loopia plans is easy and you can do that directly from your control panel. Overall, you’ll have an easy time moving from page to page. I want to believe this simplicity extends to the control panel. Apart from being neat, I like the fact that they use comparative tables to compare plans. 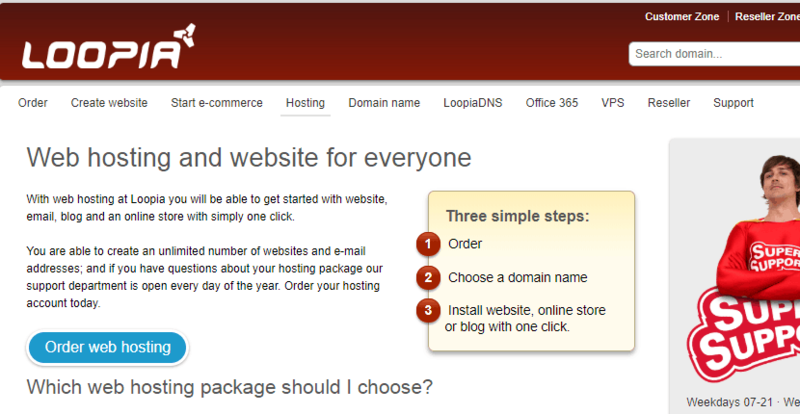 Loopia offers three shared hosting plans: Home, Business, and Business Plus. With the Home plan, you get 75 GB web space, a similar email space, unlimited e-mail addresses, and 25 MariaDB databases. You will also receive free technical support and daily backups with your Unix hosting. The Business plan is the other option on the table. With your Windows or Unix hosting, you get 150GB web space, 150GB email space, and a bandwidth of 1500GB per month. In addition, you get access to a small website builder, unlimited domains, POP3 & IMAP email accounts, 50 FTP accounts, and scripting languages. With 200GB web space, a similar storage for emails, and 2000 GB bandwidth. Business Plus is the ultimate hosting package. This plan lets you create unlimited email accounts and domains. It just builds on the Business plan. If you’re looking for dedicated hosting resources, may want to consider Loopia VPS. It comes with IPV4 and IPV6 addresses, 1GB RAM, and 20GB hard drive space. SSH access and screen console lets you manage your resources. CentOS, Ububtu, Debian, and openSUSE powered, the VPS also includes an SLA which guarantees you round the clock monitoring and support. Loopia’s customers enjoy round-the-clock support via email, live chat, and phone. You can also fill out the contact form on their website. Telephone support is available from 7.00 a.m. to 9.00 p.m. Monday to Friday; while on weekends from 11.00 a.m. to 3.00 p.m. Call and Live chat have a 1 minute wait time. The support team comes across as friendly and professional who genuinely want to help customers. So if you have questions concerning web hosting, domain name, or need help with a setup, you can count on them to assist you promptly. You can also find answers to a number of issues on their detailed knowledge base. Loopia offers entry-level shared hosting plans for those who are just starting and reliable dedicated servers all backed with a 30-day money back guarantee. Wondering how Loopia stacks up against other Web Hosting companies? Enter any other Web Hosting company and we will give you a side-by-side comparison.